If you need a quick weekend entree to impress guests, this Almond Crusted Pork Loin with Red Wine Raisins is the recipe that will save the night! Quick and flavorful, the components will leave your guests wondering how long you’ve slaved in the kitchen. Your answer? Not long at all! Ever get tired of eating the same food week in and week out? Whether you’re an organized, weekly menu planner kind of person or a spur of the moment, “whatever was available” gal or guy, as human beings we tend to stick with what we know and love. We’ll eat orzo with parmesan for weeknights on end (ask my husband) or make grilled chicken breasts over and over again because ‘it’s easy’. When you’re a chef 6 months out of the year, working 16 hour days, the last thing you want to do is think about what to make for dinner. But as a food blogger, food is my everyday life. Whether I’m shooting a new recipe or researching new trends in the market, I’m constantly trying to be inspired by it all! This winter, I’m pushing my limits and getting this inspiration to transfer to daily meals. The ones we don’t blog about, the ones that are consumed as soon as they hit the table. 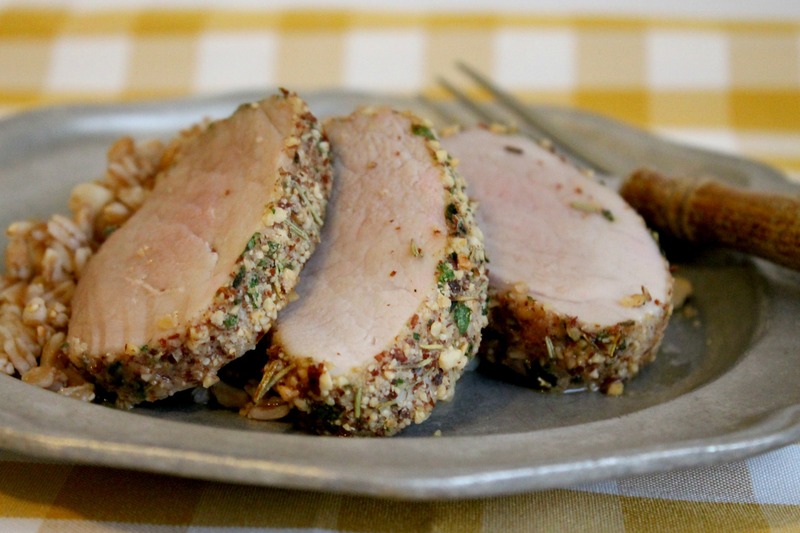 And this almond crusted pork loin was one of those, one that was photographed the day after because we had leftovers and it was too good not to share! Pork is one of our favorite proteins to consume at home and when we go out at restaurants. I’d say we consume some sort of pork product 6 our of 7 days a week. Whether it’s bacon in our omelets or pork chops for dinner, we just love the variety of pork products available. One of our latest favorites that we’ve been working with is Smithfield’s marinated pork tenderloins, which come in the following flavors: Garlic & Herb, Peppercorn Garlic, Portobello Mushroom, Teriyaki, Golden Rotisserie, Mesquite, Rosemary & Olive Oil. For this recipe, we used the Rosemary & Olive Oil, which paired perfectly with the dried rosemary and almond crust we rolled it in. Not only are the tenderloins extremely flavorful, but they cook in approximately 30 minutes – making for a quick meal! Remember the new temperature for pork is 145F, so make sure not to overcook it! To top it all off, we made a quick sauce using plump raisins cooked in our favorite red wine and a splash of maple syrup! The raisins absorb some of the wine, but cook down to a syrupy-goodness that pairs perfectly well with the pork. This sauce can also be made with stone fruit like pitted cherries, apricots, and even apples! The fantastic thing about this recipe is how adaptable it is – just make sure you start with these marinated pork tenderloins, since they are literally infused with flavor. But change up the flavors in the crust however you’d like! Don’t have almonds? Use walnuts or cashews! Don’t love rosemary? Throw in some dried thyme or oregano! Hope you make this recipe for dinner this weekend! Need more inspiration on how to use these pork loins? Almonds and herbs crust this pork loin for a delicious weekend meal to serve family and friends. Grind almonds and stir in rosemary, chopped parsley, and salt. Press this mixture onto the pork loin, making sure to cover all sides. Roast for 45 minutes to an hour, until internal temperature reaches 145F. To make red wine raisins: simmer raisins, wine, and maple syrup until reduced to 1/4 cup. This takes about 15 minutes. 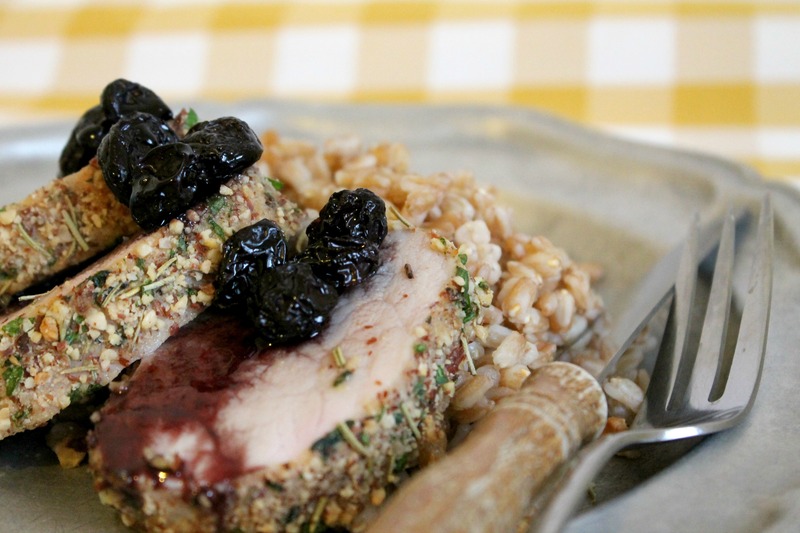 Serve slices of crusted pork loin over your favorite whole grain, in this case farro, and drizzle with red wine raisins. Disclaimer: This post is sponsored by Smithfield and I was compensated for my time. Opinions are 100% my own, as always. Very delicious. Could omit the salt. We didn’t use a whole tablespoon and it was too much. Maybe because we used a different brand pork and it might be marinated in something salty. I ADORE pork and think it gets overlooked way too often! Marking this to try this weekend or early next week. It looks crazy amazing!